What it doesn't offer is affordable housing - a platform the self-described socialist campaigned on in her bid to become the youngest female member of Congress. 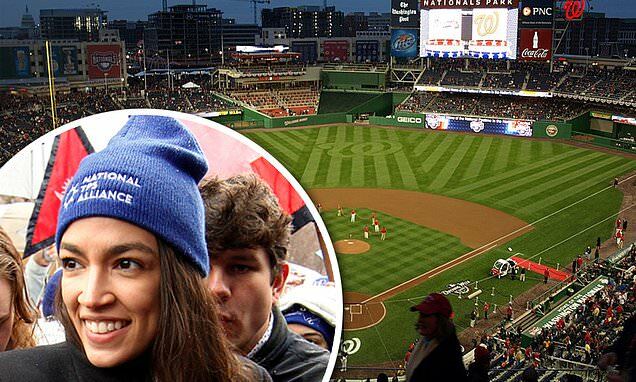 Ocasio-Cortez makes $174,000 annually with her congressional salary and has used the funds to move into the posh Navy Yard neighborhood in Washington D.C. that, ironically, is also a favorite of President Donald Trump's staffers, the Washington Examiner revealed. DailyMail.com reached out to Ocasio-Cortez's office for comment. The Yards Park - situated on the banks of the Potomac River - contains a fountain, outdoor concerts, outdoor workout classes, restaurants, and speciality shops. The neighborhood also contains a Whole Foods, which is owned by Amazon, the company Ocasio-Cortez has railed against for its corporate practices. 'Today was the day a group of dedicated, everyday New Yorkers and their neighbors defeated Amazon's corporate greed, its worker exploitation and the power of the richest man in the world,' Ocasio-Cortez wrote on Twitter last week. But that doesn't mean she doesn't use the company's services. She was spotted shopping in the Whole Foods in her new D.C. neighborhood on Thursday night, Politico's Playbook reported.